There are essentially two types of dog collars - flat, which are the fun, fashionable ones and the training collars, which are not aesthetically pleasing, but very functional. These collars are made of leather, nylon or canvas and are best used on well-behaved dogs and puppies. These are the collars that should have the dog's identification tags attached to it. The flat collar should not be able to slip off a dog's head, yet, it must not be too tight. To test if the collar is too tight, place two fingers between the collar and the neck. If you cannot put the two fingers between the neck and collar, loosen the collar until you can. There are numerous training collars available in most pet shops. But before choosing a training collar, ask your dog trainer who is familiar with these collars, for advice on which one to get. An ineffective training collar can actually hurt a puppy and hinder the entire training process. Also, training collars should not be used on dogs that are less than 16 weeks old. Remember to take the training collar off when the dog is not in training. The general purpose of a training collar is to guide the dog along and if/when necessary, use it to correct the dog with a tug. Corrections with training collars are used only when dogs are partaking in undesirable behaviours. For example, you are out walking your dog and every time he sees another dog he starts barking, pulling and making a spectacle of himself. Using the appropriate training collar and proper correction, you can help teach the dog not to go nutty when in the vicinity of another dog. Although we would not advocate the following two collar types (chain and prong/pinch), on the grounds of cruelty, many people, including well-renowned trainers, do use them as legitimate training methods. The chain collar is the original training collar because it has been around the longest. It's the collar's sound when the handler tugs the leash, not the actual restraining of the dog, that corrects the dog. Despite the chain collar's longevity, there are some downsides to it. For example, tracheal and spinal injuries, including spinal misalignment, have been associated with the chain collar. The collar also has to be large enough to fit over the dog's head, therefore, it is quite a bit bigger than its neck. Therefore, corrections are not always effective because it slides down the neck to the shoulder area, which happens to be the strongest part of the dog. The handler has virtually no chance at gaining control. This can also lead to the handler choking the dog while restraining him, which can actually make the situation worse or cause the dog to become aggressive. Another type of training collar is the pinch or prong collar. It looks nasty, but it is ironically the most effective, efficient and safest training collar. The collar's prongs fit snugly against the dog's neck. Therefore, when the handler goes to make a correction, minimal effort if required, but maximum effect is made on the dog. Martingale or check choke collars are half fabric and half chain - a combination flat collar and choke collar. These are good for dogs that take correction easily. Like the chain collars, it is the sound of the collar tightening, not the restraining that teaches the dog the expected behaviour. Electronic collars have become a quick solution for many dog owners; however, many trainers do not recommend the e-collars, as they require a lot of experience in understanding canine behaviour in order to be effective. They can also be rather expensive. The only type of electronic collar that has proven to be safe and effective is the anti-barking collar. These are designed for uncontrollable barkers, not the dog that makes the occasional bark when the doorbell rings. The dog's barking triggers these collars, which helps to condition the dog to not bark. Another type of training collar is actually not a collar at all, they are head halters, commonly known as gentle leaders or haltis. "It works on the 'mommy' principle. When your dog was a pup, his mom would correct him by grasping his muzzle and shaking it. This communicated 'Hey wild one, settle down!' The chin lead has the same effect," according to Sarah Hodgson, author of Puppies for Dummies. The head halters can calm dogs down, help smaller handlers manage larger dogs, as well as stop the dog from any ground sniffing or picking up of unwanted items from the ground. However, the head halters have the potential to cause neck damage. 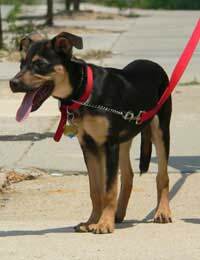 When the handler corrects the dog, via the leash attachment under the chin, they generally do so by simultaneously pulling up and to the side, which causes damage. Some trainers also claim the head halter does not solve any of the behaviour problems a dog can have, as it does not teach the dog responsibility for its action. The dog is not being taught yes or no to his actions, therefore the dog is not learning either through positive or negative reinforcement. Use a leash that matches the weight of the dog. For example, a 10-pound Toy Poodle should not be attached to a two-inch thick leather leash, but rather to a thin lightweight leash. Extendable leashes are not recommended for a dog of any size. If a dog sees something he wants, he can run, into traffic, until the leash runs out. The leash's handle is also awkward and does not enable the handler to get a firm grip on a pulling dog. Also, depending on the size and strength of the dog, the leash can actually break.